AUTOFORCAR.COM – Toyota Rush: one of the reasons consumers choose a SUV is due to the type of vehicle it has characters that are capable of devouring a variety of road conditions. Toyota Rush initiated his career in December 2016 with a sporty and masculine look. The presence of the Toyota Rush contribute to elevating the medium SUV segment. All New Rush with the concept of "Tough and Dynamic". The characteristic of brave and tough SUV from a medium SUV. Exterior design All New Rush changed significantly with the concept of "Modern & Dynamic". The main light in the flat design with additional LEDS which blends in harmoniously with the grille and sporty bumpers. Display the side showed a character dashing through the sturdy design as well as 17-inch alloy wheels (TRD Sportivo) and tires with kuran 215/60. egitu is also part of the stern, which has a dazzling display with LED lights which luxury and left horizontal box design in tune with the trend of current SUVS. Keep in mind the lights with LED technology this reflector can also offer brighter lighting and evenly. All New Rush comes with the features of the Auto Headlamp type TRD Sportivo. Interior design concept that is owned is Premium Tough Feeling so give a sense of comfort in the cabin for passengers and driver. 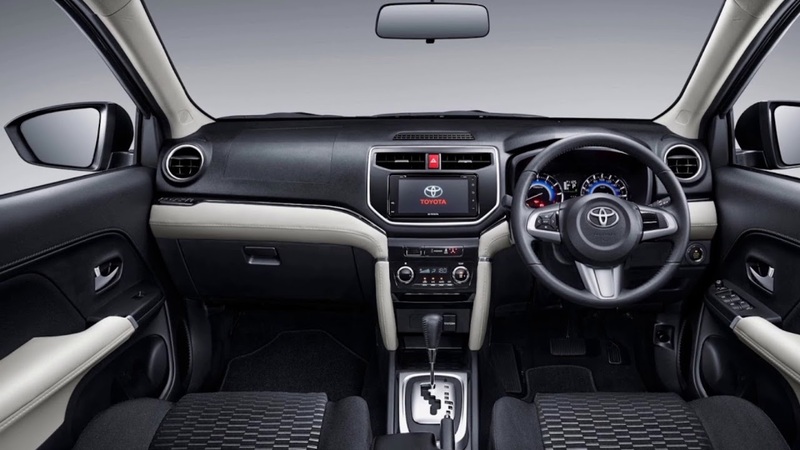 Two-tone dashboard on a variant of the TRD Sportivo comes a touch of soft-touch gives a luxurious and elegant design. The circumference of the steering wheel on a 3-spoke design makes it convenient when gripped during the trip. There are also 13 cup-holder from the bench the first row to the third row. All variants of the All New Rush already available 7-seater passenger accommodation for many. Similarly, the configuration of the bench and the space in the trunk, the 2nd line can be viewed easily using one touch tumble, while the third row can be folded with the configuration 50:50. 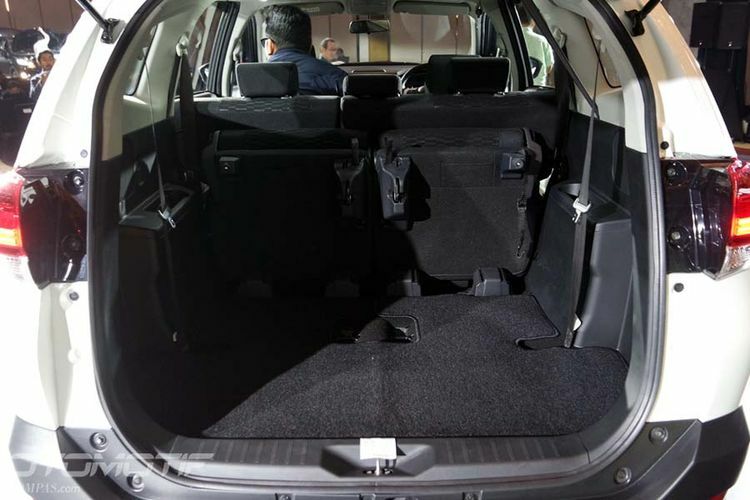 The entire line-up of fed 6 airbags (driver, passenger, 2 side, 2 curtain), and Vehicle Stability Control (VSC), which was previously available on the highest variant Innova, Fortuner, and the Sienta Q. At the bottom, All New Rush is also equipped with a 16 "front Brake Disc Ventilated side panels that are larger than the old version. All New Rush is also equipped with 3-point seatbelt and headrest for 7 passengers and are equipped with an anti-lock Braking System (ABS) in the section on braking. All New features of Rush Hill-Start Assist Control (HSA) which is very useful in the field of the road uphill so it gives a sense of comfort. Not only that, All New Rush also provided a feature Vehicle Stability Control (VSC) to maintain stability as it passes through the bends. All New Rush has the dimension of length to accommodate the 7-passenger and luggage space on the left. Ban serep commonly located at the back of the door, now moved to the bottom to make it look more modern. All New Rush has the dimension of length of 4,435 mm, width of 1,695 mm, 1,705 mm high. With a wheelbase reached 2,685 mm and the distance of 1,450 mm front rodan foothold, 1,460 mm rear. Machines that used All New Rush 1,500 cc capacity, with an additional Dual VVT-i technology to provide adequate performance and optimal fuel consumption. Engine All New Rush has code 2NR-VE I4 4-cylinder, 16-valve, DOHC so capable of producing a maximum power of 104 PS at 6.000 rpm and maximum torque of 13.9 Kgm at 4.200 rpm. The above power comes with two options of manual transmission 5-speed automatic and 4-speed. While the line-up All New Rush 4 comes with a choice of 2 types, i.e. type G and type TRD Sportivo.